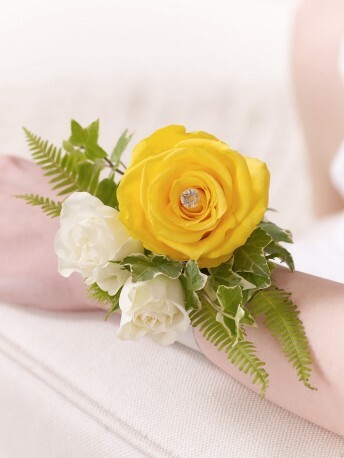 The golden shade of this stunning yellow rose makes a glorious centrepiece for this radiant wrist decoration. Partnered with cream spray roses, greenery and a hint of sparkle, this is a pretty choice that will add the finishing touch to a beautiful outfit. Featuring a yellow rose and cream spray rose heads with variegated ivy and fern set onto a white wrap wristlet and finished with a diamante pin.